Sir Richard Branson can now add 'hotelier' to his resumé – and the results are glorious. When Sir Richard Branson launched Virgin Atlantic in 1984, people were hoping he’d change long-haul flying forever. Now, he’s poised to do the same thing for the hotel business. Years after the first announcement and after a long wait, the first Virgin Hotel finally opened its doors in Chicago earlier this year. And how is? Great! On the first look, it comes across as another, albeit stylish, budget design hotel. But if you look closely, you discover how much thought went into all the details. Case in point: the rooms. Instead of your standard, crammed hotel room, Virgin Hotel offers a two-chamber room layout with tons of small touches that make traveling for business or leisure an easier experience. All guest rooms are divided into two spaces by sliding doors, complete with a peephole. That means that if housekeeping accidentally enters your room while you’re still sleeping, they won’t be standing next to your bed but rather behind another closed door. Lifechanging! Among the clientele targeted by Virgin Hotels are female business travelers (finally!) and that translates into many awesome features that will please both sexes: The dressing room includes a full vanity, make-up desk and mirror, an extra-large shower with a bench, and his and hers closets designed by Poliform. Slide open the privacy doors and guests will enter the lounge with a red Smeg mini-fridge, a smart TV, a custom-designed table that swivels and a Paltrona Frau task chair. There are plenty of power outlets on the bedside, a nifty feature that we at 12hrs think is too often overlooked. Virgin Hotels has also taken working from bed to another level. The brand’s ergonomically designed bed is the ideal space for setting up shop while on a long business trip or to stream a movie on your laptop. At the heart of the Chicago property is The Commons Club, a space where guests can dine, drink, work and mingle, as well as attend the nightly hosted Social Hour. The vibe is one of a private members club, without the fees, where guests and locals alike are welcome. The Commons Club menu, created by Chef Rick Gresh, features a variety of internationally influenced small plates, from Stuffed Potato Tots to a Cauliflower Caesar, and Cider Mussels or a Lobster Flatbread. 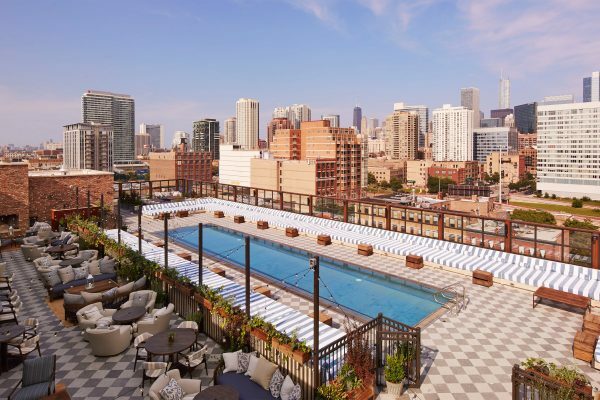 Virgin Hotel Chicago is dog-friendly, offers free, high-speed wi-fi in every room and doesn’t charge extra fees for room service delivery, early check-in and late-check out. A second location of the young chain is scheduled to open in Nashville in the summer of 2016, and a third property in New York City in the fall of 2017. By 2015, the brand is hoping to have hotels in 20 locations. We’re looking foward!